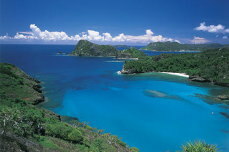 Ogasawara Islands consist of more than 30 islands scattered in the vast area of Pacific Ocean. From the north, Mukojima Islands, Chichijima Islands, Hahajima Islands, Iwo Islands and 3 isolated islands which are Nishinoshima, Minami-torishima (earsternmost of Japan) and Okino-torishima (southernmost of Japan). The main island is Chichijima located 1,000km south of Tokyo and the surface is about 24k �u. Ogasawara belongs to subtropical zone and the climate is maritime and not much temperature change. The most attractive point of Ogasawara is its rich natural environment which has developed with subtropical and maritime climate. These islands have never contacted to any continets, so there live a lot of indigenous species (50% of flora and fauna are said to be endemic) which developed in its unique environment. So its nick name is Eastern Galapagos. You can watch whales and dolphines very near, and there are most beautiful diving spots in Japan. Submerged caldera of Minamijima Island is unique and beautiful landscape. You will feel refreshed in the subtropic scenery surrounded by primary forest.